The fight over the Conga mining project is one of Peru’s largest current social conflicts. Today, the local population continues resisting the imposition of one of Latin America`s largest gold mining projects – Minas Conga. The situation remains tense, and the resistance continues, but with an intensified sense of urgency because as the battles are won and lost, many feel that the conflict is nearing its conclusion. The struggle against the Conga project has been a long and arduous one already (1). To summarize, Conga is a 4.8 billion dollar project of Yanacocha – a company which combines the interests of Newmont mining corporation (US-based), Buenaventura (Peru) and the IFC of the World Bank. It aims to destroy the head of the water basin for the province of Celendin, and in part that of neighboring Cajamarca and Hualgayoc, leaving severe water shortage and contamination. This would prove disastrous for the mainly rural provinces of the region of Cajamarca, in the northern highlands of Peru, where the majority of dwellers live by agriculture and cattle rearing. It would be an aggressive open pit mining project, an Earth-destroying technique that Newmont itself initiated in the early 1960s (2), and similar but more expansive than Yanacocha`s previous work in Cajamarca. For this the population rejecting the project have a fair idea of what is in store – all they need to do is look next door to the devastation that 20 years of open pit mining has left in its wake (to see more about the particulars of this devastation please see the aforementioned article). The campaign against the project is growing stronger, constantly renewing itself as the pressure crushes the spirits of some and makes space for others. The struggle doesn`t belong to any one person, or any particular high-profile figure, as the mass media would have you believe, rather the struggle is of the people, and for this it remains strong. Though it is this very fact that has led to an intensification of the repression and criminalization of the resistance – as the government and Yanacocha become ever more desperate to push the project through ‘by blood and by fire’ (3). A woman who is shining example of the resistance, some say the embodiment of it, is Doña Maxima Acuña Chaupe who leads her family in their fight to defend their land – which happens to sit in the heart of Conga. The mining company, once they realized that their dogged attempts to buy up all the land destined for exploitation had left a few holes – one hole being the Chaupe family`s land, they tried to drive the family away by violence and intimidation. Due to courage and perseverance against all the odds, the family successfully resisted. So now the family find themselves in a legal battle spanning years, which has been riddled with negligence, corruption and foul play. They continue to be harassed constantly by the police, mining security and certain locals who are believed to have been paid by the mining company to intimidate the family. Amnesty International recently released an Urgent Action calling for a stop to the harassment which included death threats (4), as did the women`s network ULAM (5). The family claim they will not give their land up as they are the rightful owners; they believe the mountain lakes are sacred, and are willing to protect them, and Mother Earth, at all costs. So if the mining company continues with its mission to forcibly evict this campesino family, they would be violating their right to a home, to a safe environment, to food (as their land is their source of food) and perhaps even their right to life. The repression also extends to the entire resistance movement and only intensifies with time. 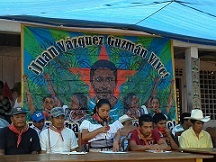 Mirtha Vasquez, a local human rights lawyer from Cajamarca, in her report ‘Criminalization of the protest in Peru’ details how the state has assumed the role of protector of neoliberal economic interests, and as such, deliberately and systematically tries to eliminate elements that threaten to disturb the working of this model (6). The arms of the state body that it uses to crush dissent include lawmaking, the judicial system, the police and armed forces, and the intelligence services. Since 2002, Vasquez explains, successive Peruvian governments have passed a series of laws limiting the right to protest and granting greater power to the police and armed forces in social conflicts. In 2007, the government passed laws against organised crime, but by classifying the social protest as ‘extortion’ they are able to use the same laws to imprison a protester for up to twenty-five years, a sentence even greater than that handed down for some murders. Other charges include disturbing the peace, irreverence of patriot symbols and promoting rebellion. During the Conga conflict over the past two years there have been over 300 people charged with various alleged crimes. However, as Vasquez states, these are not indiscriminate charges – 90 percent are social leaders or local authorities who have been openly critical of the government. We saw an example of this on 8th April when six men were apprehended on their way to a mobilization at the mountain lakes. Amongst the group was Freddy Garcia, a candidate for the local municipality of Huasmin (one of the districts closest to Conga), and the only candidate who is against the Conga project and the supporting hydroelectric project Chadin II. They were first stopped by Securitas, the Swedish security company providing security to the mine, who then called the police who happened to be just around the corner. The police trailed them from the car and beat them before arresting them. They were taken to the city of Cajamarca and then in the middle of the night they were taken to Chiclayo, eight hours from their home province. Their arbitrary detention brought the people out onto the streets – instantaneous protests sprung up in the cities of Celendin, Cajamarca and Chiclayo. Groups protesting mining projects in Chiclayo brought food to the prisoners and held vigils outside the jail. The government quickly realized this act of repression was uniting rather than crushing dissent and so after three days the six men were released without charge. The authority of the Rondas Campesinas, the local peasant patrols who have their authority inscribed in the Peruvian constitution since 1986, is also attacked because they are organized against the mining project. The practice of bringing an accused person to a rondero assembly to hear evidence and vote on the culpability and punishment has been delegitimized and has resulted in certain rondero leaders being charged with kidnapping. One such leader was looking at 32 years in prison for leading the interception of a group of soldiers who were taking advantage of underage girls. The abuse of underage girls was a regular occurrence during the states of emergency and left at least ten minors as single mothers. After a long legal battle the rondero leader escaped prison but had to pay a hefty fine. In stark contrast, the police and armed forces enjoy an increasing degree of impunity for their actions during social conflicts. Amongst other liberties, they can hold a protester incommunicado for an excess of twenty-four hours; they can remove bodies from a scene without the presence of state investigators; and, as of 14 January 2014, neither the police nor the armed forces can be held accountable in a criminal court for injuries or deaths from using their arms or ‘other means of defense’ while on duty (7). This seems to be a shocking development but in reality this impunity has long been in existence. Not a single member of the security forces has been held responsible for the brutality, the allegations of torture, the scores of serious injuries, nor the five deaths – all acts perpetrated in the name of `crowd control`. Eye witnesses tell how the police and military scanned the streets for bullet casings the day after the fatal shootings on 3rd July, so as to leave the shooters unidentifiable. The Public Prosecutor of Celendin at the time wrote in his report how young 16 year old Cesar Medina received a fatal bullet to the head, and that this bullet came from an army helicopter above. On 28 January 2014 the National Coordinator of Human Rights in Peru (CDDHH) announced that the case seeking justice for the five murdered protesters had been archived due to a lack of evidence (8). The CDDHH is appealing this decision. A particularly worrying aspect of this situation is that the police are not only taking orders from the state, but also directly from the mining company. Law 27238 enables police directors to sign agreements with private companies to provide security services. They can do this in conjunction with or separate from their state duties, but are all the while permitted to wear police uniforms and use state-provided weapons. So while the police are using violent aggression against the protesters and violating each citizen`s right to protest, it is unclear if they are doing it under orders from the state or from the mine. Other human rights regularly abused are the right to free transit – as the mining security block communal roads, the right to organize, to freedom of assembly, and the right to consultation as this project is being forced through despite an obvious lack of social license. This is not to mention the rights that would be trampled on if the project goes ahead (right to water, safe environment, livelihood, health, life). However the population do not sit quietly accepting these abuses, they have learned that they have to force the authorities to respect their rights. On 22nd April people from every corner of the province of Celendin congregated in the city and marched to the Public Prosecutor`s office demanding that he come out and explain why he was judicially persecuting so many local community leaders. He sent out his apologies at first then, when he saw the people weren`t going away he finally emerged. In the end he promised to respect the law of the Rondas Campesinas and to investigate the litany of legal charges against the community leaders. Only time will tell if he keeps his promise, but he knows that if he doesn`t, the people will return. They now know that justice has to be fought for in the streets. Newmont is well aware of the opinion of the local people. Motions have been brought by local groups to the Inter-American Commission of Human Rights, the EU and the UN. The Denver Justice and Peace Committee – an activist group in Denver, Colorado where Newmont is based, stages regular protests in front of the company`s offices amongst other advocacy work. Recently a US-based NGO EarthWorks led a letter, which was presented at Newmont`s shareholder meeting, proclaiming against the injustice of the intimidation and harassment of protesters in Cajamarca and over 50 other organizations joined their call. 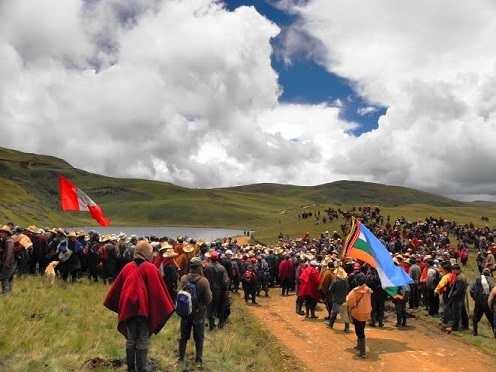 Earlier in the year delegations from Cajamarca marched to Newmont`s offices in Lima to once again declare the position of the people, an act commemorating the National Water March in February 2012 where hundreds of thousands marched from Cajamarca to Lima. But what shows more than anything that the people of Celendin, Cajamarca and Hualgayoc will not give up this fight is their constant presence and vigilance up at the mountain lakes. Despite all the repression and attempts to install fear into the hearts of the protesters, the Guardians of the Lagoons continue to protect the lagoons that give them life. They know that if this destructive project goes ahead it would mean the end to their way of living as agriculturalists, the end to their health and the health of their animals, the end to the future of their children and the generations to come. They will not give up, because they can’t.